For Sports Coaches, Teens, Students, Young Women who are Awesome ages 14-30!! Having fun getting active, talking about group dynamics, working with tweens, values based coaching/leading and more! 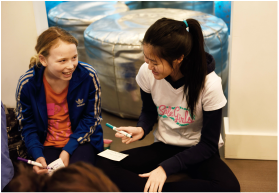 PLUS connect with other coaches, leaders in our community and our Sole Girls coaches and Soleteers! Interested in becoming a coach?